I am delighted to welcome you to Galgotias College of Engineering and Technology (GCET), an institution dedicated to provide quality engineering education. GCET is recognized as a state leader in teaching and learning, student relationships and well being. The main focus of the Institution is to empower students with sound knowledge, wisdom, experience and training both at the academic level of engineering and in the highly competitive global industrial market. The infrastructure facilities and state-of-the-art equipments combined with a galaxy of competent, talented and dedicated faculty contribute to an enjoyable and an easy learning experience. GCET is very eco-friendly campus and is equipped with state-of-art infrastructure. We have well equipped labs and libraries to help students in attaining highest standards in academics, research and professional skills. The campus also has adequate sports infrastructure for recreational activities. I wish you a very happy and academically highly rewarding student life in GCET and hope that you with your good deeds will enhance the pride and prestige of this prestigious institution. Dr. V.K. Dwivedi holds a Ph.D degree from IIT-Delhi and his research is on Solar-Thermal. He graduated in Mechanical Engineering from Madan Mohan Malviya Engineering College, Gorakhpur, Uttar Pradesh and also earned his Masters on Design of Process Machines from Motilal Nehru Regional Engineering College, Allahabad, Uttar Pradesh. His expertise lies on Heat Transfer and Thermal Sciences and has a rich experience of over 20 years in Teaching, Research and Industry. 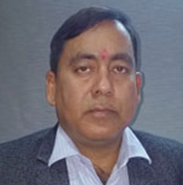 Dr. Dwivedi has published more than 25 research papers in reputed International journals of high impact factor and presented many papers in International Conferences. He had successfully guided 04 Ph.D students and is presently guiding 01 Ph.D students in the area of Solar Thermal Energy. He has also authored one book on Heat and Mass Transfer. Dr. Dwivedi had delivered many lectures in IIT-Delhi during QIP courses conducted in the Centre for Energy Studies & in other Institution of repute.